We're always searching out lighthouses, and we had such a search in mind as we recently stopped in Ashtabula, Ohio during a trip along Lake Erie. 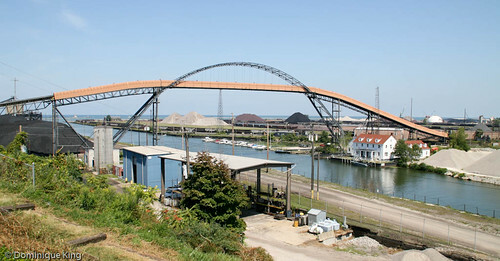 Ashtabula is a major coal port, situated at the mouth of the Ashtabula River and northeast of Cleveland. The heavily industrial lakefront in a town of 20,000 may not look that intriguing at first glance, but we saw some interesting sites, learned some fascinating things about Ashtabula's history and found an intriguing link to a famous Parisian landmark. We hit town and began driving as close to the lakefront as we could. We quickly found the city's Point Park, which offered a panoramic view of the harbor, shipping docks and a coal conveyor. If we looked closely, we could see a tiny red-and-white lighthouse--not the most awe-inspiring view of the light. 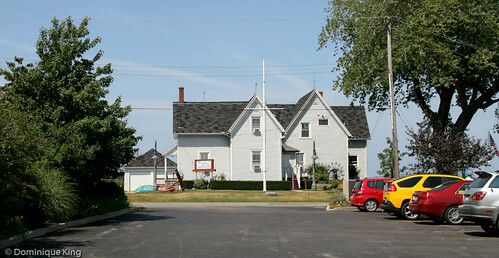 We took a quick glance across the parking lot and saw the Ashtabula Marine Museum, located in a former light keeper and Coast Chief house built in 1871-1898. Since this was a quiet weekday afternoon, the museum wasn't open, but I remember that it had some interesting exhibits and well informed docents when I toured it by myself about eight years ago. The park also has a bucket from a "Giant Hulett" machine, a huge device developed by George H. Hulett in 1898 to unload iron ore from freighters. This piece of machinery wasn't particularly picturesque, but it certainly gave you an idea of the massive undertaking dealing with tons of iron ore entailed. The most fascinating thing for me at the park was the Bascule Lift Bridge, and knowing my fascination with bridges, that should come as no surprise. I heard a horn blow and looked up the river, away from Lake Erie, to see the lift bridge in action. The term "bascule" is a medieval word for draw bridge or a French word for seesaw and balance. Bascule bridges are moveable bridges designed with a counterweight to balance the bridges as they lift for boat traffic. Ashtabula's bridge is one of only two such bridges in Ohio and earned a place on the National Register of Historic Places in 1976. Ohio's other bascule bridge is in Lorain. The Ashtabula Bascule Bridge operates 24 hours a day during the summer season, lifting every half hour so pleasure boaters can travel to and from Lake Erie. A tender minds the bridge from a control room below the counterweight, sounding a horn, and lowering gates to stop cars and pedestrians from crossing the bridge during its lifting and lowering. The bascule bridge operates on the same sort of system used to raise and lower drawbridges over moats surrounding fortresses in the 15th and 16th centuries, according to an informational sign in Point Park. The sign went on to say that a pontoon bridge spanned the river starting in 1850. The floating bridge was too unstable, plus widening the river channel to accommodate larger boats meant a swing bridge replaced the pontoon bridge in 1889. (Now you know why I always take photos of signs and historical markers as I travel). Thomas E. Brown designed the first bascule bridge in the 1890s, but history knows him best for designing the original elevator in Paris' Eiffel Tower. Wendell P. Brown, no relation to the more famous Thomas E. Brown, designed the Ashtabula Bascule Lift Bridge in 1925. The bridge underwent a $3.2 million restoration in 1986. We only spent a short time in Ashtabula and Point Park, but I found plenty of things to merit a return trip. I'd love to see the Ashtabula Bascule Lift Bridge lit up at night. I'd love to see Ashtabula County's many covered bridges. And I'd love to further explore Ashtabula's Underground Railroad connections. Looks like a great lighthouse. I'm hoping to see them make the Ashtabula Lighthouse accessible as well.